Against a backdrop of dwindling flocks and a secularising society one congregation is daring to buck the trend. 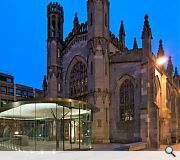 St Paul’s & St George’s Episcopal Church in Edinburgh has an expanding and vibrant congregation that had found itself constrained within the confines of their A listed home on York Place. 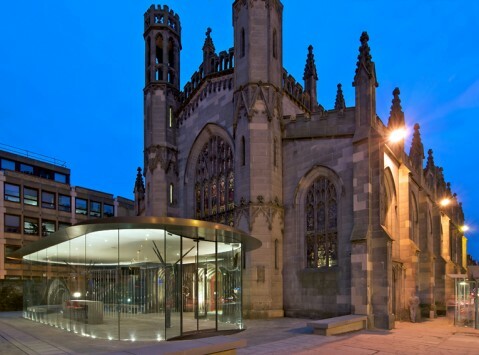 It fell to Lee Boyd Architects to provide a £4.5m contemporary solution to their plight, imparting renewed vitality and vigour to the historic church and showcasing a symbolic statement of the Church’s intention to look forward through positive change. 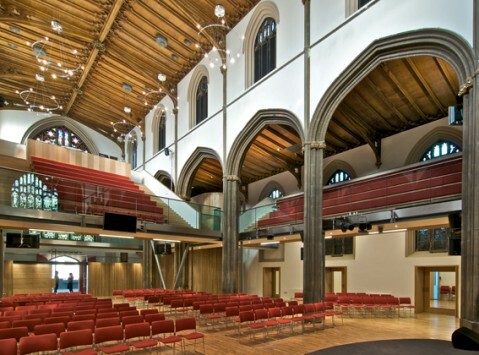 Challenging preconceptions over what a listed building should be proved critical to these works and called for a sprightly re-jig of the church interior with construction of new gallery space interlinked by light walkways to impart an impression of floatation through the church volume whilst doubling capacity to 800. In addition the replacement of pews with flexible seating has allowed the church to accommodate a range of performance functions in addition to worship. Extensions to the body of the church provided further scope for capacity, an expressive welcome is granted through a frameless glass pavilion that preserves the gravity of the gothic façade with an uncompromisingly modern solution.